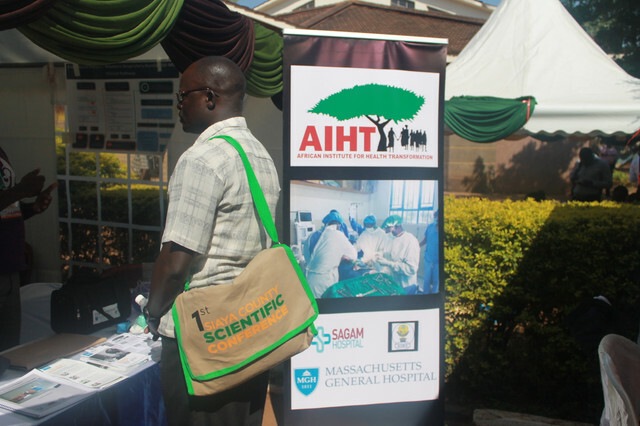 Home » AIHT » RECAP: AIHT at the 1st Annual Siaya Scientific Conference. 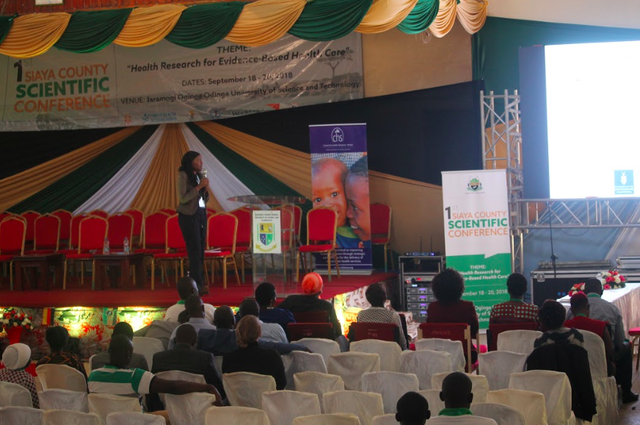 RECAP: AIHT at the 1st Annual Siaya Scientific Conference. 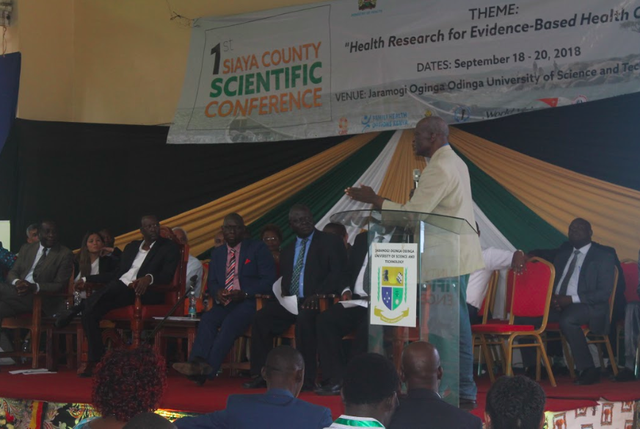 The African Institute for Health Transformation (AIHT) at Sagam Community Hospital (SCH) was a significant participant when Siaya County held its first Health Scientific Conference from 18th to 20th of September, 2018 at Jaramogi Oginga Odinga University of Science and Technology (JOOUST) in Bondo. This was also the very first such conference by any County since the devolved system of governance was established in Kenya. The well attended conference was officially opened by His Excellency (H.E.) Governor Mohamed Kuti of Isiolo County, the Current Chair of the Council of Governors Health Caucus. The opening ceremony was also graced by Siaya County’s Deputy Governor, Dr. James Okumbe, Siaya County’s Minister for Health, Dorothy Owino, the Siaya County Chief Officer for Health, Dr Omondi Owino, Siaya County’s Director for Health, Dr. Kennedy Oruenjo, Senior Health Sector Directors, JOOUST administration, Development Partners and Heads of NGOs active in the County. 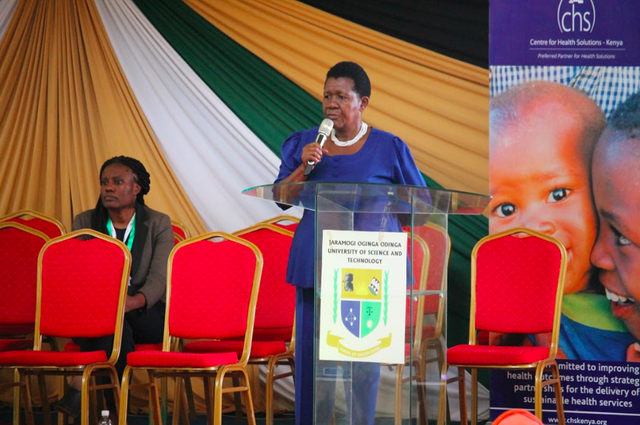 SCH’s founder, Prof. Khama Rogo, also provided a guest address during the opening ceremony. 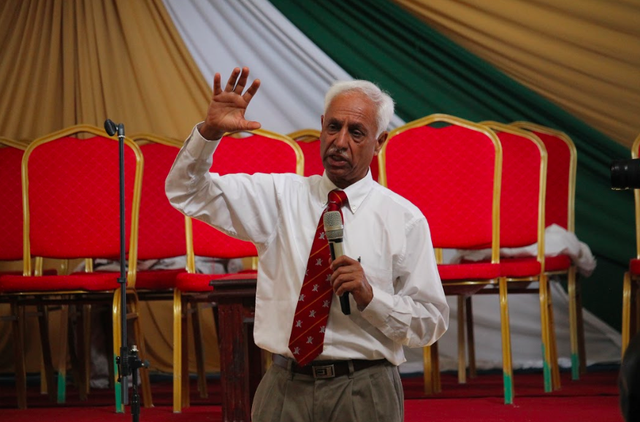 Prof. Pankaj Jani, President of the College of Surgeons in Eastern, Central and Southern Africa (COSECSA), gave a guest address on the prospects for decentralized Collegiate training of Surgeons in the Counties. 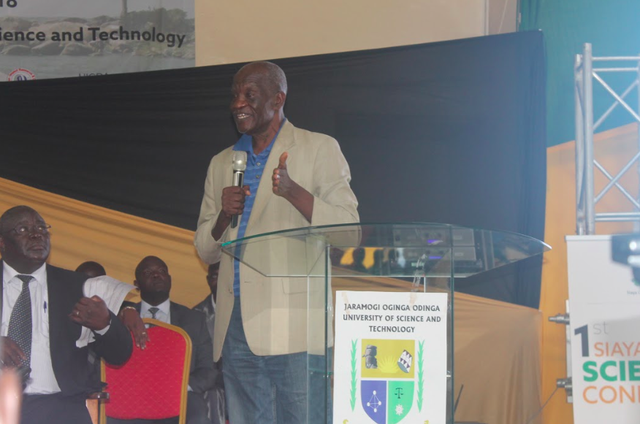 AIHT was active and visible: Prof Khama Rogo gave the key note address reminding the County of its historically large skilled human resource base in the health sector and its inverse proportion to the poor heath indices. He urged the County leadership to adopt innovative ways of involving this group, as they had a lot to contribute and were willing and ready to do so at no cost. Feasibility of an Online Interactive Platform for Continuous Professional Development for Healthcare Providers in Kenya and beyond (presented by Debora Rogo of SCH). Dr. Nyamogo leads the presentation focusing on ESM-Ketamine. Debora Rogo chairs AIHT symposium. Assessing Wearables for Monitoring of Pregnant Patients with Hypertension in Siaya County (presented by Molly Guy of Medtronic Labs). The highlight of AIHT participation was the display kiosk, shared between SCH and KMET. KMET displayed their highly acclaimed ESM – Uterine Balloon Tamponade (ESM-UBT) for management of Post partum hemorrhage. Sagam Hospital displayed the ESM=Ketamine innovation for use where there is no anesthetist. 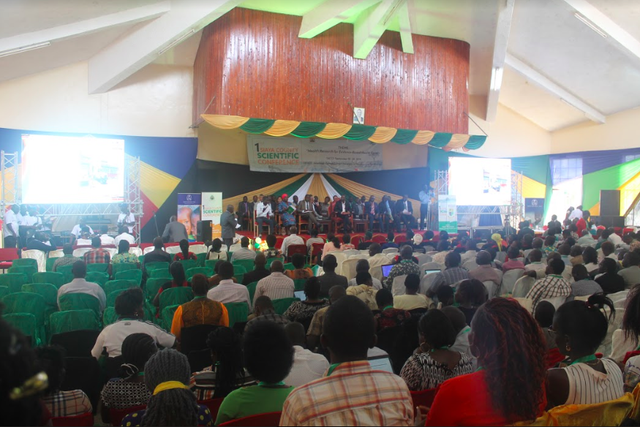 This technology is already in use in ten Counties, following provider trainings at Sagam and full endorsed by KOGS. The Province of Saskatchewan in Canada has also recognized the technology and has sent two clinical groups for training in at Sagam. 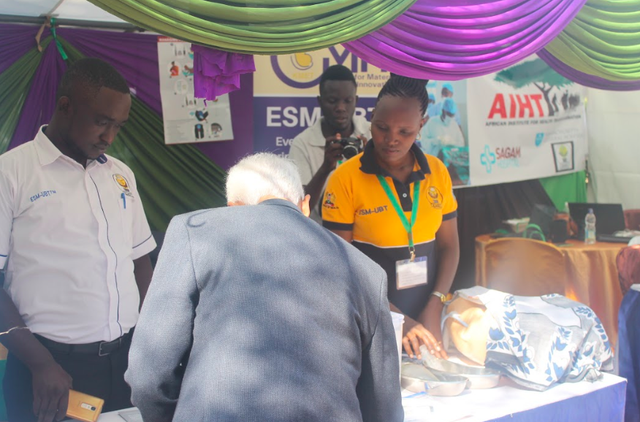 Another innovation on display was ESM- NRB, a simple technology for newborn resuscitation, and the Empower Health app by Medtronic Labs that is being implemented at SCH towards management of hypertension. 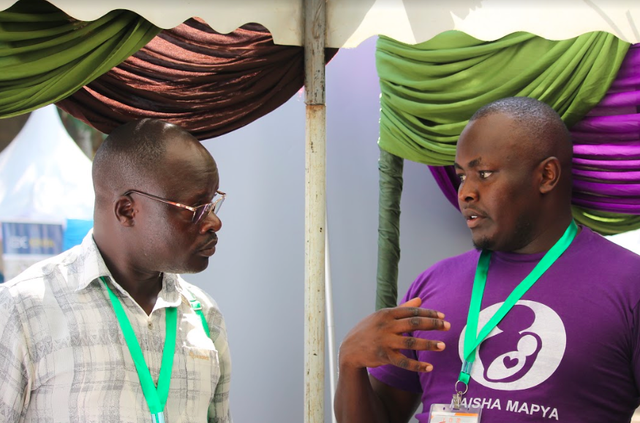 Medtronic Labs also included information on the new Maisha Mapya pilot program, which they are implementing with SCH to assess whether technology can be used to monitor blood pressure in hypertensive pregnant women. The displays kiosk was always inundated by curious health workers and managers, anxious to learn more about the new technologies and their applications. 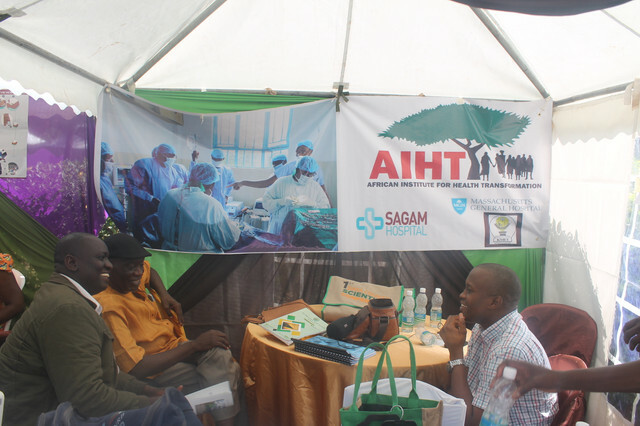 Another popular attraction was information on the weekly free outreach services that Sagam Hospital runs on request from local community groups. Tens of participants were anxious to make use of this facility and were advised on how to apply. Additionally, Prof. Jani and Jaymie Henry joined Prof Rogo in a meeting with Health CEC to discuss surgical training in the County. They agreed to sign an MOU to support training of Surgeons and Gynecologists using the joint resources of Sagam Hospital and the Siaya County Referral Hospital Hospital. The parties will raise additional resources to invest in this endeavor. The three days of the conference felt like a whole month due to the heavy workload. AIHT flag flew high and attracted many new fans and admirers. All this could not have happened without the hard and untiring efforts of the Sagam and MGH team. Many thanks to Benson Sewe, Javan Imbamba, Dr. Richard Luate, Dr. Charles Ochola, Dr. Khama Rogo, Dr. Mary Anne Nyamogo, Juddy Odhiambo, Fredrick Owino, Sebastian Suarez, Brenda Ochieng’, Molly Guy, Washington Dinga, Eric Angula, Chemuttaai Lang’at, Millicent Olulo, Leslie Ojeaburu and Sebastian Karlson. We also with to thank the Medronic Labs team and Pharmaccess Foundation, who were part of the AIHT team. AIHT owes them sincere gratitude. Special thanks also go the County health leadership, the conference organizers, Prof Jani and Jaymie Henry for making time to participate. We all look forward to next year’s conference- better and bigger. AIHT will be there!